Running Press Miniature Editions, 9780762493135, 32pp. 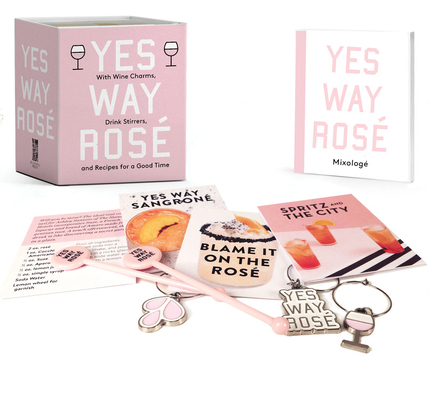 With enamel wine charms, cocktail stirrers, and irresistible recipe cards, the Yes Way Rosé Mini Kit is the ultimate celebration of the pink drink. Live your best life and celebrate all those rose vibes with the Yes Way Rosé Mini Kit! This charming gift set is the perfect pairing for your favorite bottle of rose -- so get ready to party! Erica Blumenthal and Nikki Huganir are the founders and creative voices behind Yes Way Rosé. Erica Blumenthal, a graduate of the Fashion Institute of Technology, has worked as a fashion editor and writer at numerous publications, including Interview, JANE, and Spin. She also wrote the "Browsing" column for the New York Times prior to starting Yes Way Rosé in 2013. Nikki Huganir, also a graduate of FIT, has a background in graphic design. She has designed for fashion magazines, including JANE and T, the New York Times style magazine. Prior to starting Yes Way Rosé she worked as an art director for fashion retail brands.